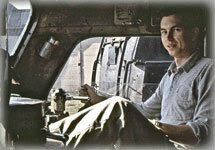 "Back in the 80s when railroads were going bankrupt left and right, Ed Burkhardt got a heck of a deal on a Canadian Pacific line from Chicago to the Saint Paul and some assorted branch lines. ["Soo line."] CP had just overbid on the remains of the Milwaukee Road, needed cash fast to pay for the railroad they expected to be overbid for, and Ed Burkhardt was in the right place at the right time. "They had no idea what all rail cars were on their line and what waylaid cargoes they contained! For weeks on end, rail cars and cargo rolled up and down the railroad, sometimes passing their actual destination multiple times. And those were slow trains of lost cars, pulled by a fleet of cast off locomotives so unreliable that they’d be sent out with twice as many locomotives as needed, in hopes enough would keep running to make it home. "Eventually Ed Burkhardt’s Wisconsin Central became a reliably mediocre railroad, well suited to low value cargo that was in no hurry to go nowhere. 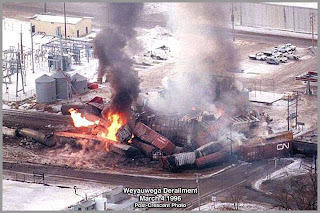 "Then in 1996, after regular garden variety derailments and such, Wisconsin Central managed to pile up a few cars of quite flammable HazMat hit a small Wisconsin town. The blaze was so intense that firefighters had to retreat and watch the fire burn out while over two thousand residents were evacuated for two weeks. "I feel absolutely awful about this. I'm devastated by what's occurred in this community. I have never been involved in anything remotely approaching this in my whole life." Bet the residents of Weyauwega would have loved not to have "been involved" in the situation they found themselves in when Mr. Burkhart was "driving the bus." 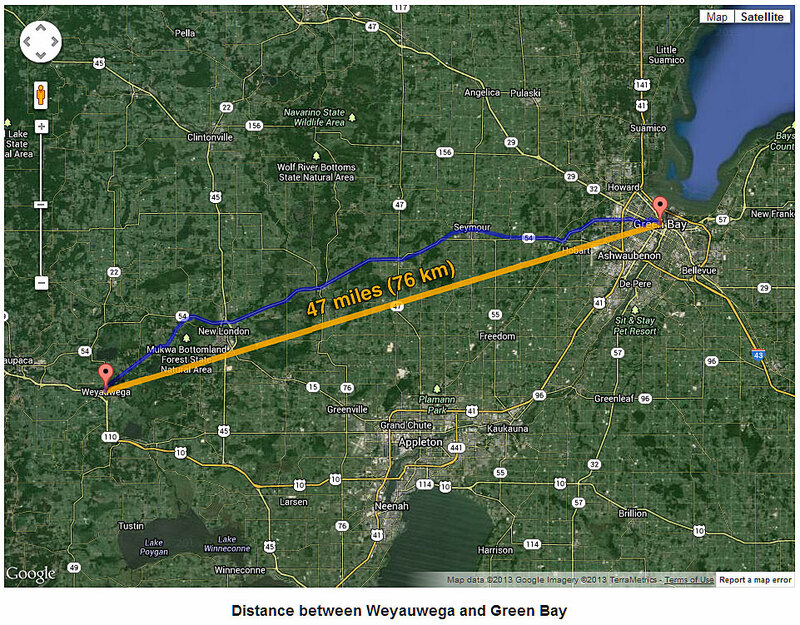 Like Lac-Mégantic, Weyauwega, population more than 3.000, is also located on a lake. Weyauwega Lake. "On March 4, 1996 at about 0550 Central Standard Time, Wisconsin Central Limited (WC) train LO22-4, consisting of 2 locomotive units, 68 loaded freight cars, and 13 freight cars, derailed the 17‘h through 50th head cars at Weyauwega, Wisconsin. "Sixteen of the derailed cars contained hazardous materials, including two loaded with sodium hydroxide, seven loaded with liquefied petroleum gas (LPG), and seven loaded with propane. The derailment resulted in a release of hazardous material that caught fire and consumed 7 of the cars loaded with LPG and propane. The fire also burned a local feed mill building. "High tension electric lines were knocked down, and city water and natural gas services were disrupted. About 3,155 residents of the town were evacuated from their homes. Highways 10 and 110 were closed, as well as all county roads leading into the area. There were no injuries directly attributable to the derailment, but three persons suffered minor injuries during the evacuation. The derailment resulted in an inferno as four tank cars carrying liquid propane ruptured and caught fire. Close to a million gallons of propane burned within 100 feet from the main natural gas feeding line to the community. Not only was the accident unpredictable, but also the evacuation came as a surprise because residents were removed from their homes with no allowance for gathering essentials and other belongings. 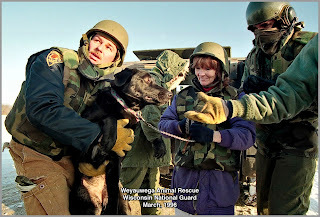 Later, Residents were ferried into the danger zone by the National Guard to retrieve wallets, medications, and pets. • Papers - as in "important papers." "We put the residents in flak jackets, Kevlar helmets and gave them earplugs in case there was an explosion. We brought in six armored personnel carriers to transport the residents to their homes. Sorties into the city lasted about a half hour. It was a joint operation with a National Guard driver and a sheriff's deputy in the vehicle with the residents. Once the all-clear signal was given 15 days later, Wisconsin Gas utility went house-to-house in the empty town to shut off all 700 meters. Next, the crew made minor repairs to the gate station and re-pressurized and purged the gas mains, leaving the system on test overnight. To begin re-entry, Waupaca County emergency services staff devised a strategy in which Weyauwega was divided into four zones based on the Wisconsin Gas restoration plan. This helped in the coordination of buses and routing of families back into the town. A convoy of 40 Wisconsin Gas technical services employees from Milwaukee and other offices drove to Weyauwega to assist with the relighting efforts. Using gas leak detection equipment, they swept each building and secured it. They were teamed with electric, water and construction crews who assessed any damage to homes and appliances. The primary owner of a residence or business was allowed on the premises with the inspection crew and was allowed to return permanently only after it was declared safe. With the exception of some water damage, no other severe scarring was done to the homes. How could Mr. Burkhardt have forgotten such a dramatic - if not traumatic - event? U.S. National Transportation Safety Board concluded a broken switch-point rail that they said was not properly maintained by Wisconsin Central caused the derailment. According to an NTSB report filed in August 1997, Wisconsin Central's track inspectors should have caught the broken rail during federally mandated monthly inspections. "The switch point rail broke due to an undetected bolt hole crack that progressed from improper maintenance because Wisconsin Central management did not ensure that the two employees responsible for inspecting the track structure were properly trained," the NTSB report said. 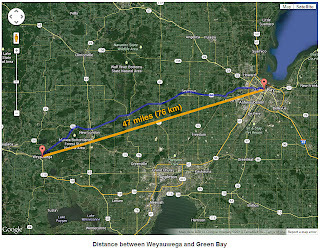 • The Weyauwega Wreck cost Wisconsin Central USD$27 million in damages. • January 30, 2001. Canadian National (CN) announced a plan to purchase WC for USD$800 million and assume USD$400 million of WC's debt. The deal closed on October 9, 2001. While the 18-day evacuation order stands as the longest displacement of residents from their homes, it was not the largest number of residents evacuated. That record goes to the massive derailment and fire at Mississauga, Ontario on November 10, 1979, near Toronto. The presence of a tank car of chlorine in the midst of a conflagration of liquefied petroleum gas cars led to an evacuation of nearly 500,000 people. It was later determined that the chlorine car had indeed been breached and most of its contents had escaped in the thermal plume. Wow, now that is a story the mainstream media never picked up. Great job.